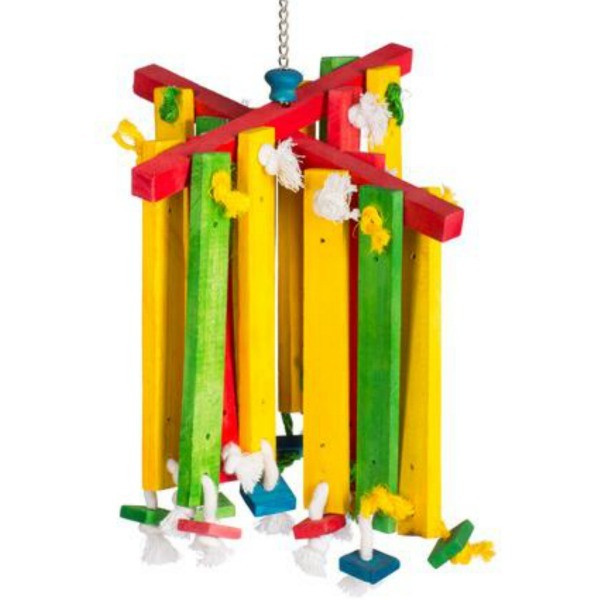 Loving to chew, birds love wood toys. 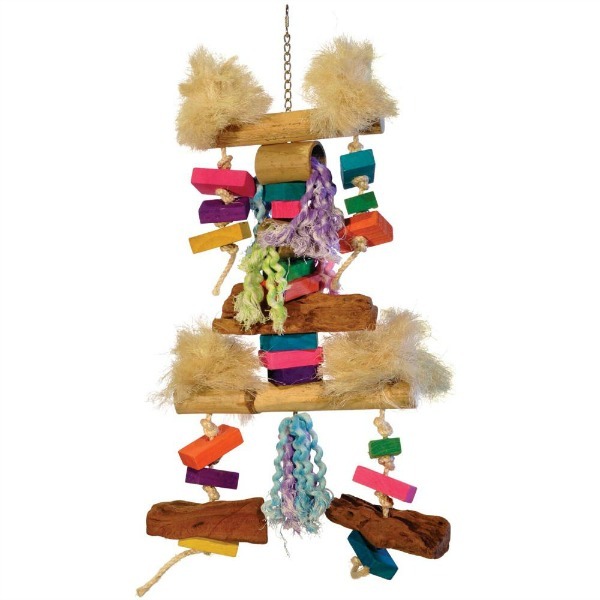 There are colors, shapes, sizes and textures that are certain to suit every feathered pal of every species or size. 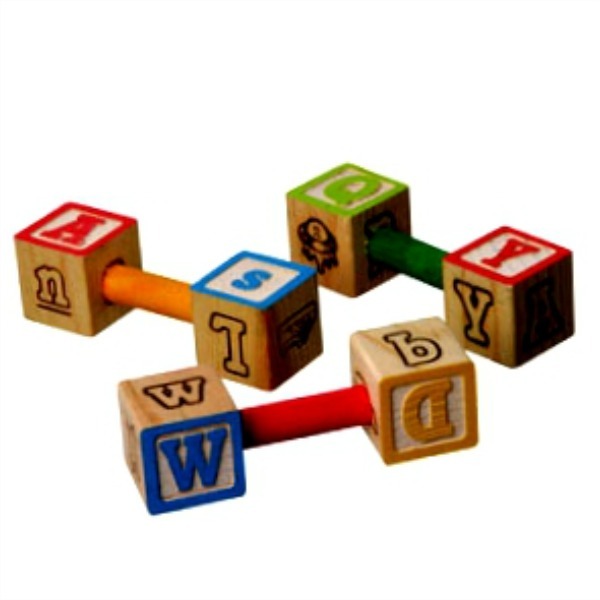 Some of the items youâ€™ll find listed in this area are for creating toys of your own design and the parts are very inexpensive. 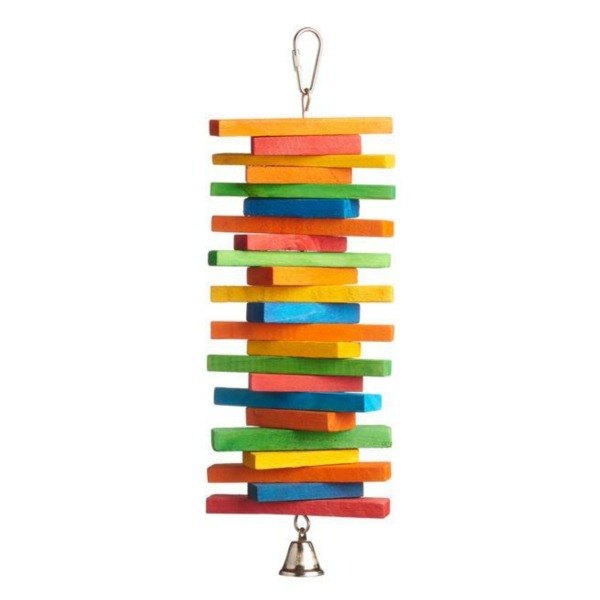 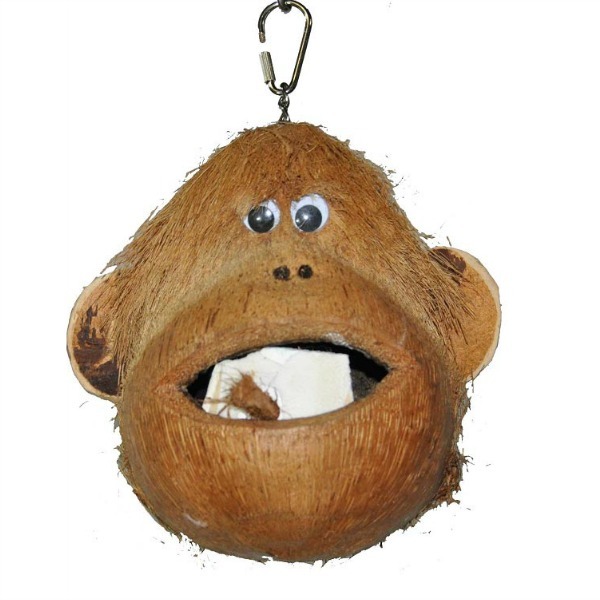 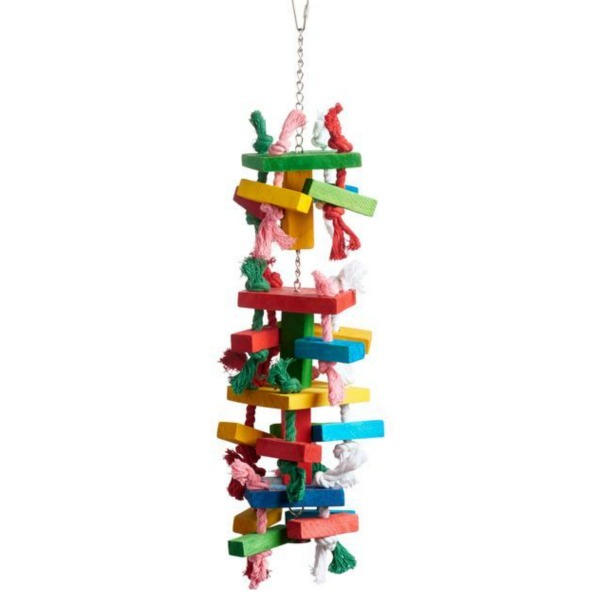 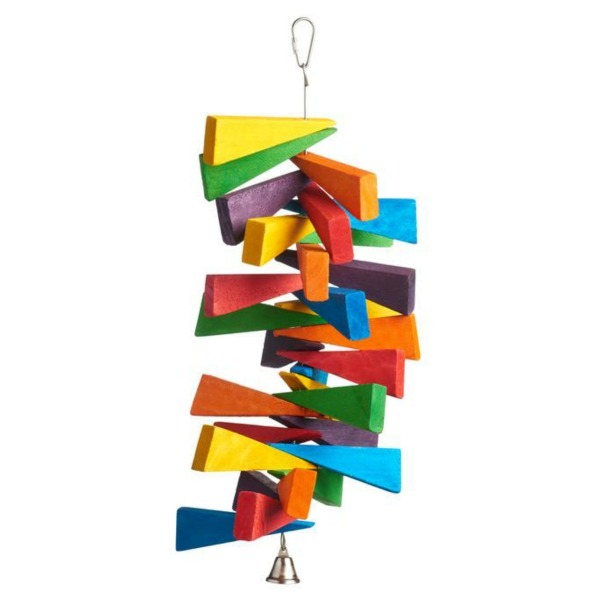 Other toys made from wood are huge colorful wooden and chain designs as large as five feet in height for those really big birds that can shred a lesser toy in minutes â€“ like hyacinth macaws and the largest cockatoos. 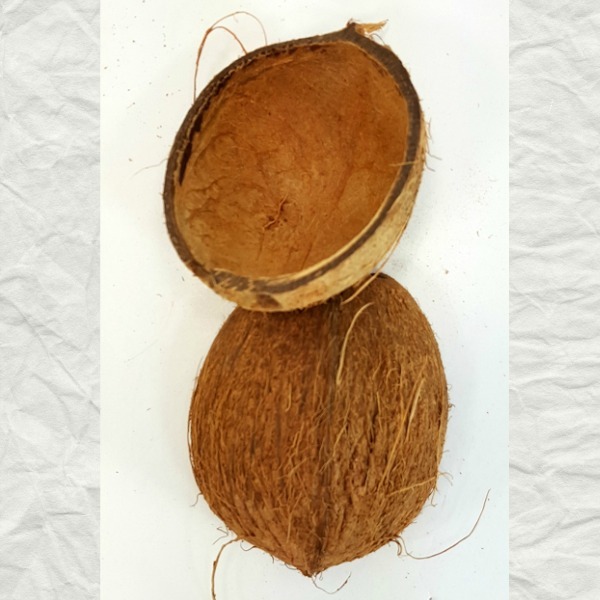 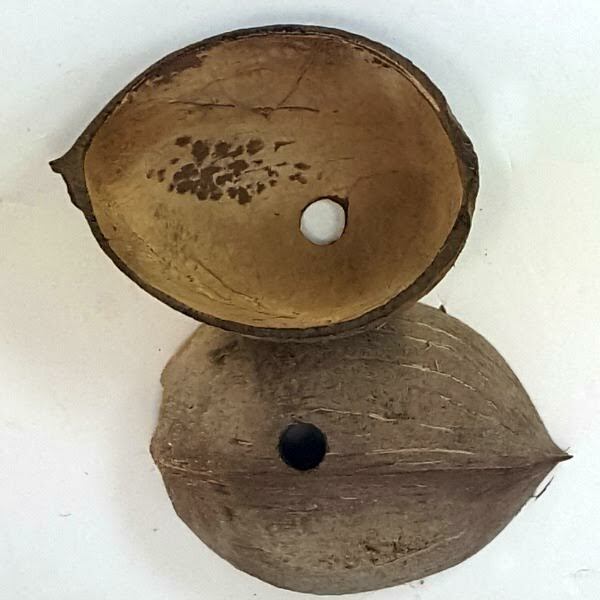 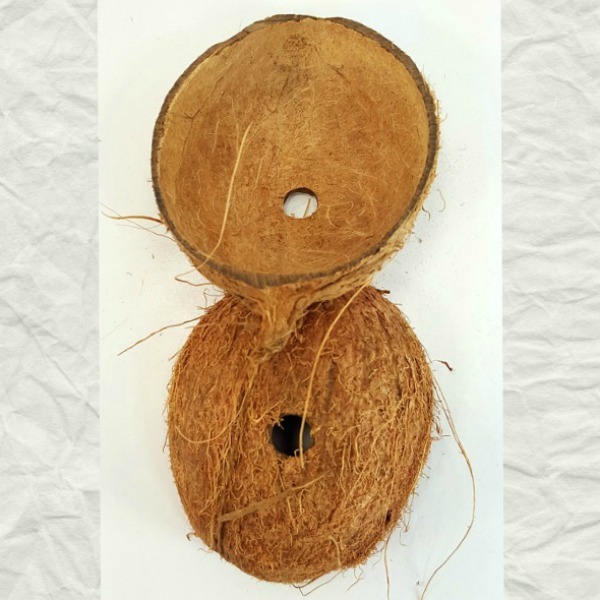 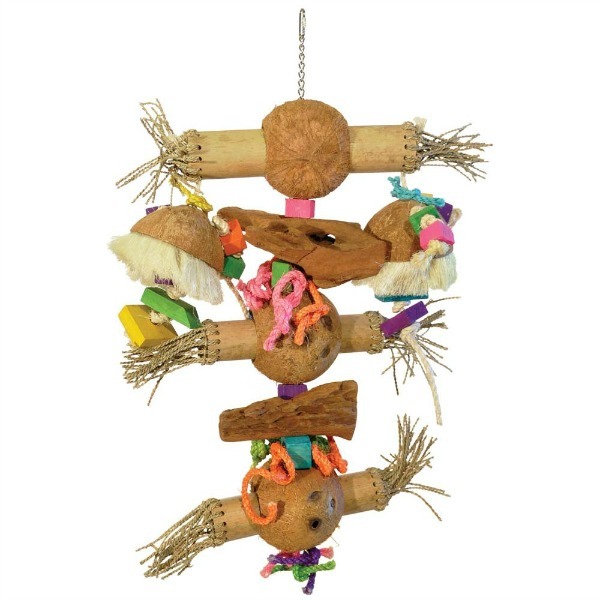 Some toys that include wood contain openings for the owner to hide tidbits of goodies to mimic foraging activities â€“ an activity that takes up much of a wild birdâ€™s life and that instinct remains in our companion birds today. 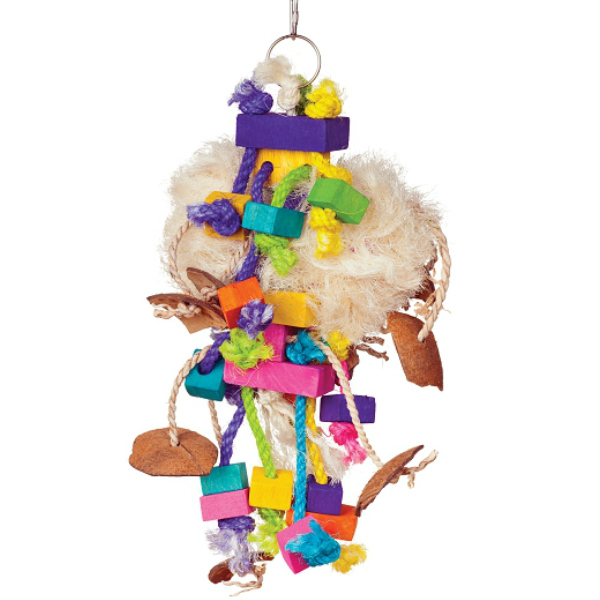 Other toys made from wood combine rope, leather or sisal enhancements to allow the bird to have the secure feeling of preening a flock mate â€“ a great way to help feather pickers or pluckers break the bad behavior by having something positive on which to focus that energy. 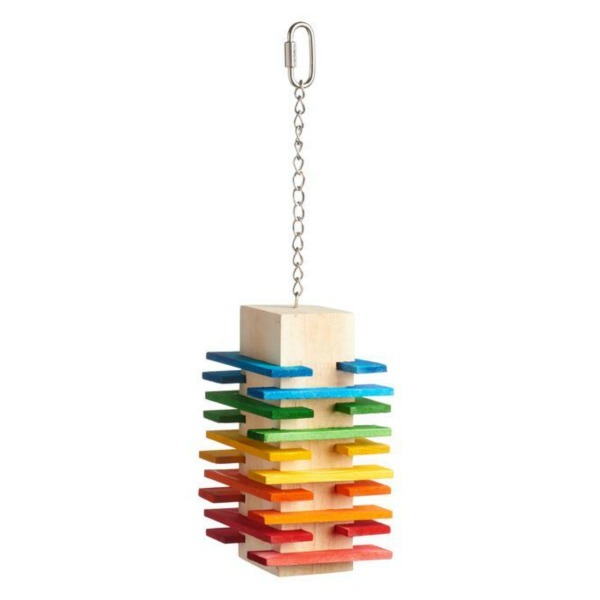 While our birds love brightly colored toys in their environment, we humans also like wooden toys that look nice inside the cage. 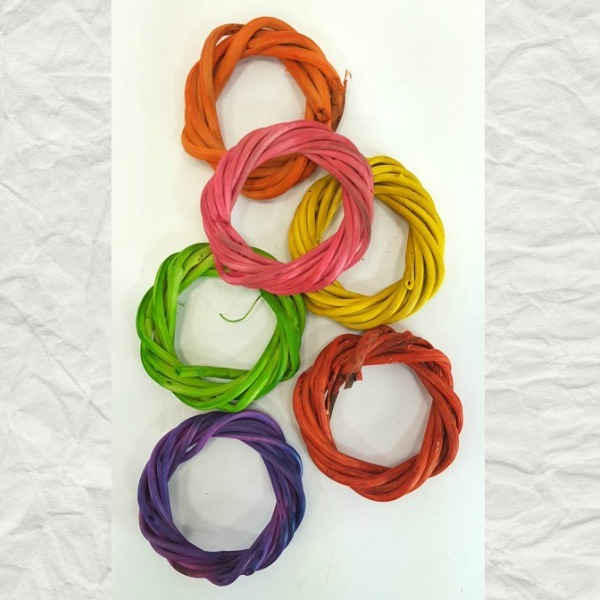 The bright shades of bird-safe dyes are very appealing to the birdâ€™s eye and yours. 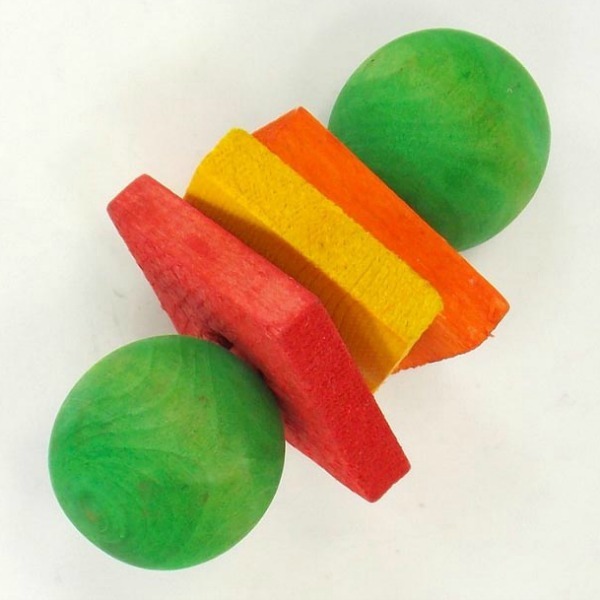 Some of the wooden toys are safely flavored to encourage chewing and toy play. 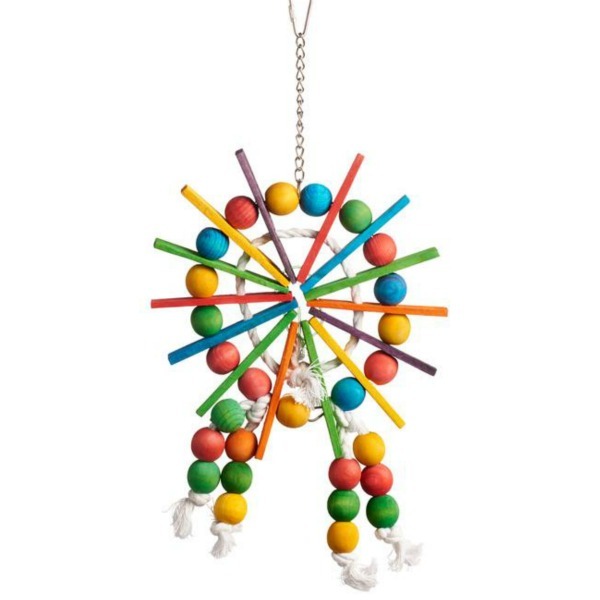 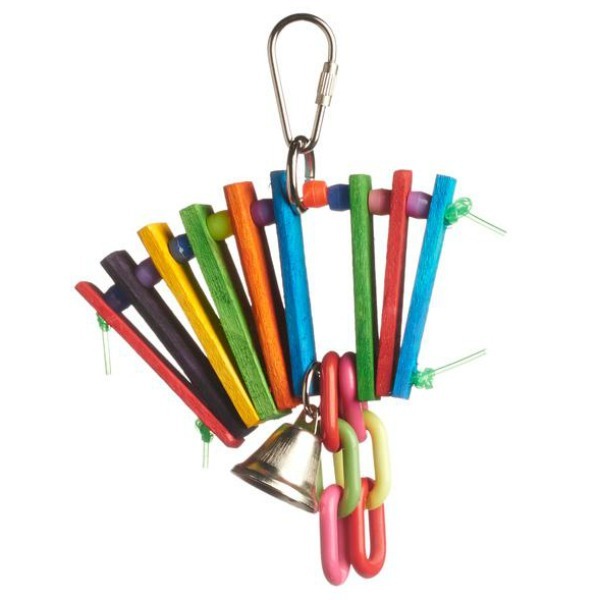 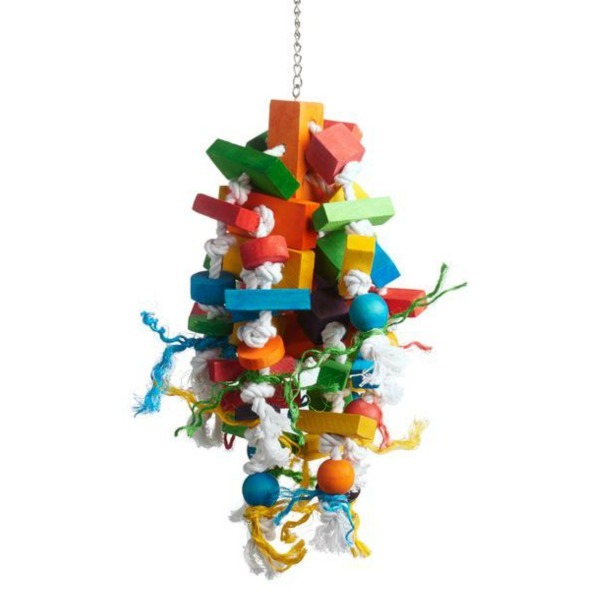 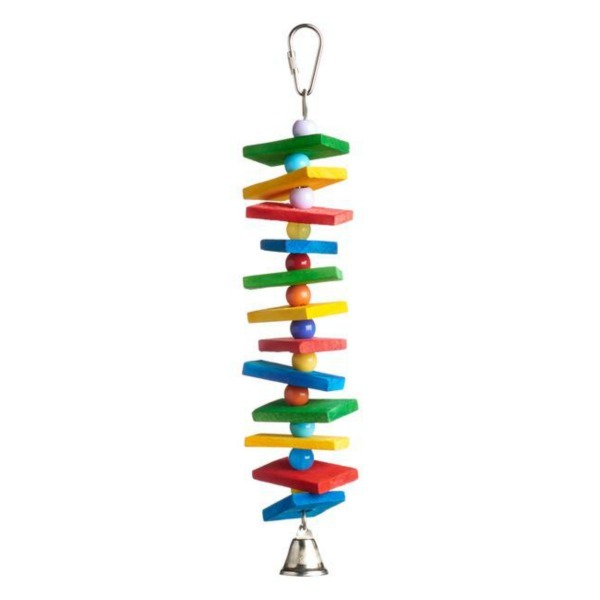 Make that good to play with toy more appealing to your bird than chewing on the kitchen cabinet doors or dining table. 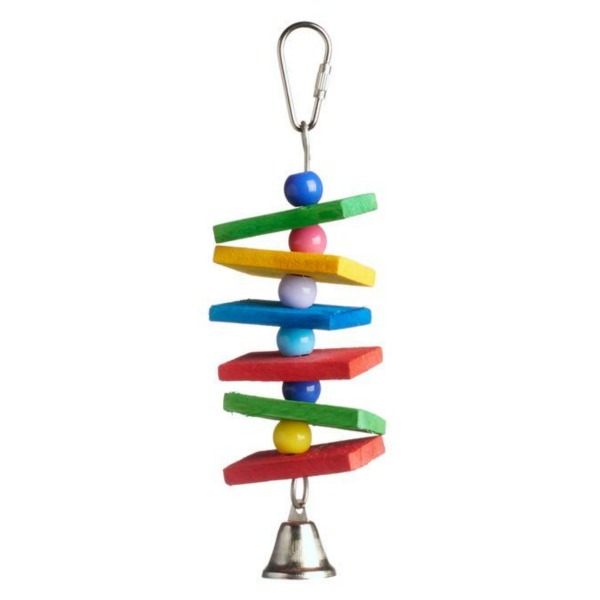 It is easy to teach your bird to chew the right things when they are pretty and taste good. 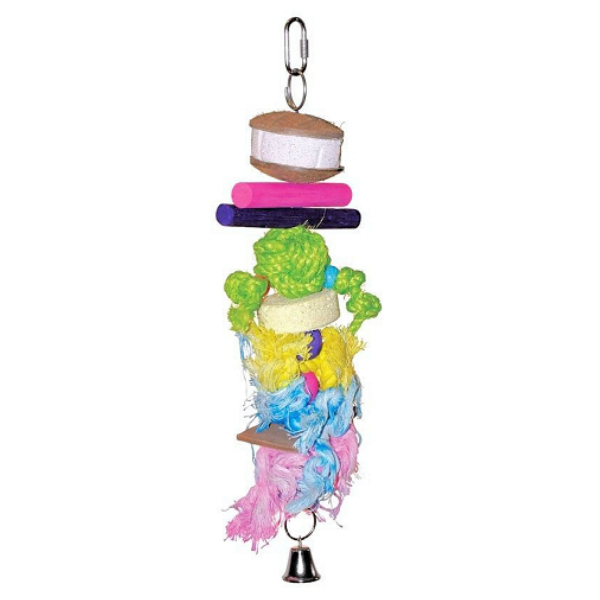 To provide the best quality of life for our companion birds, a wide variety of toys and perches is critical. 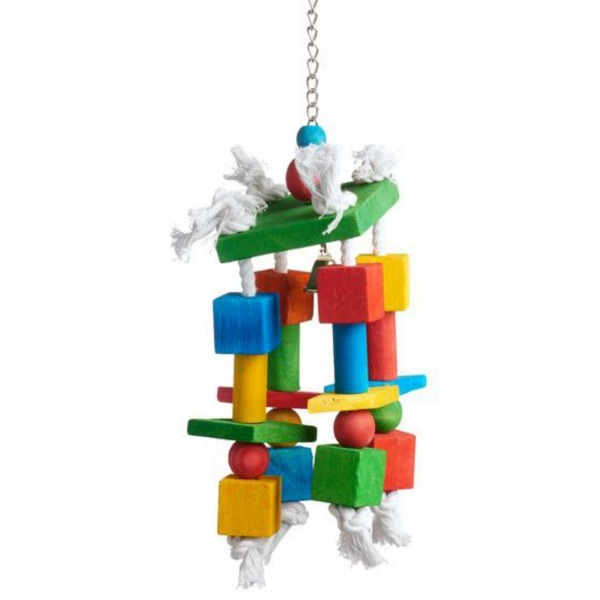 Swings with wooden perches, bridges for balancing with hanging chew tabs, foot toys crafted from wood and other shapes all improve your birdâ€™s happiness during those hours you canâ€™t spend providing quality one on one out of cage time. 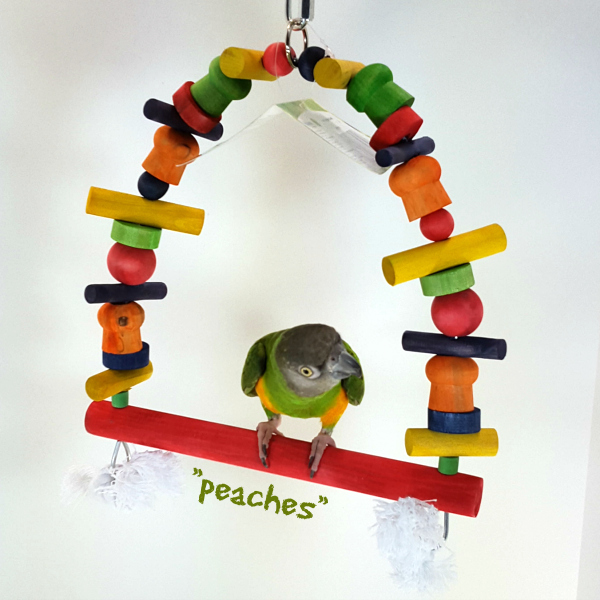 Parrots also love to play games with their humans. 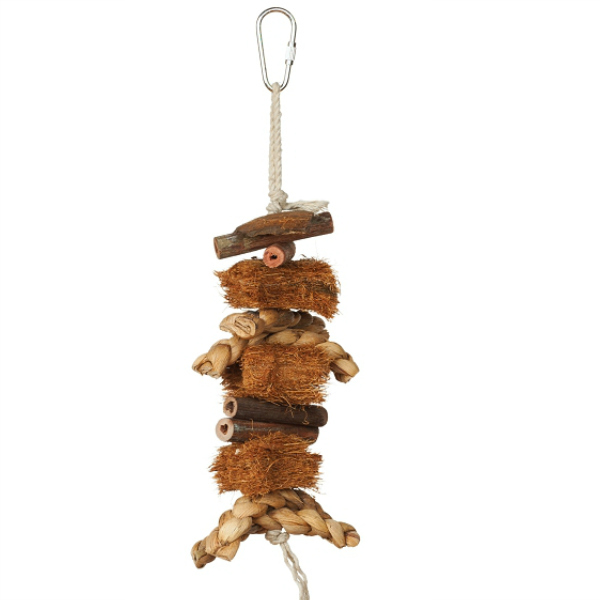 A time proven favorite of all species has simple rules: give the bird an appropriate size wood foot toy. 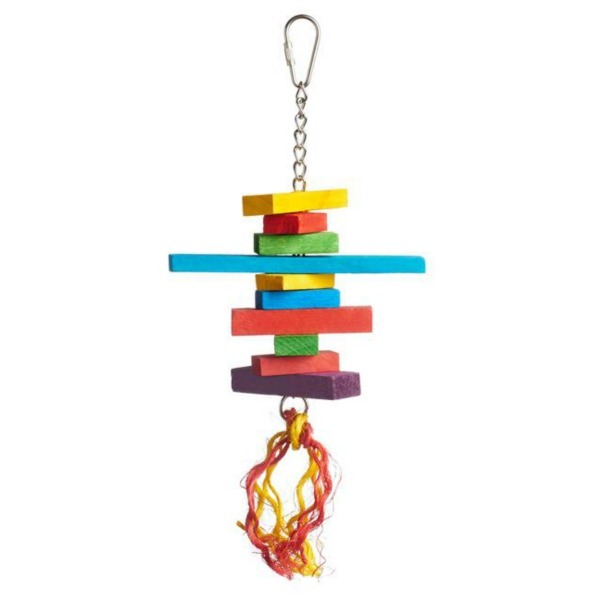 Watch the bird place it in its beak and walk to the edge of your play location. 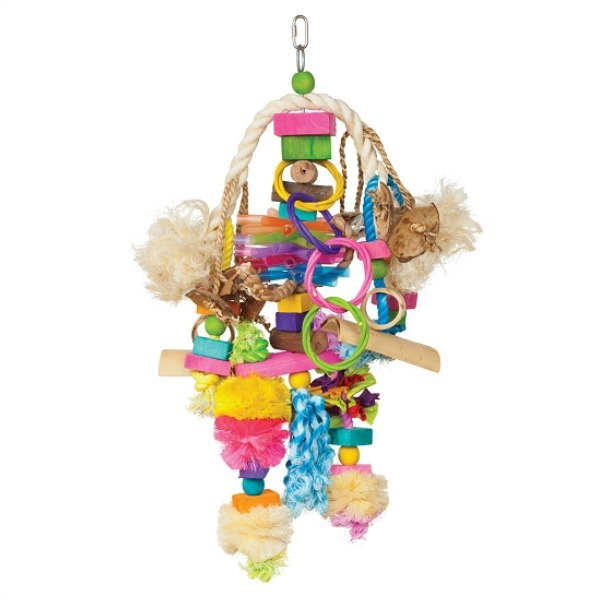 The bird drops the toy and looks down at the toy, then at you, clearly communicating, â€˜Oops, I dropped it, please pick it up for meâ€™. 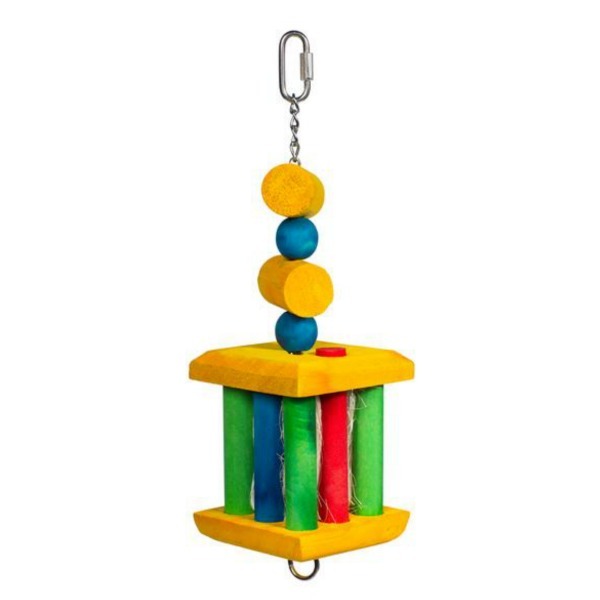 Like a good human you fetch the toy, only to have the process repeated until you or the bird tires of the game. 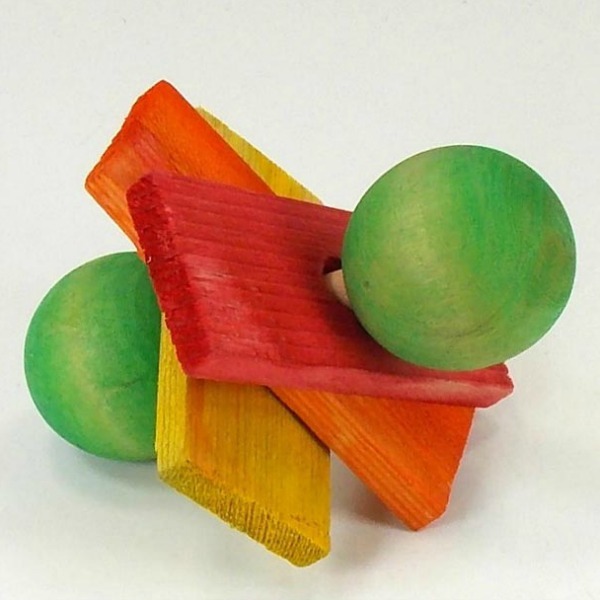 Usually the human gives up first. 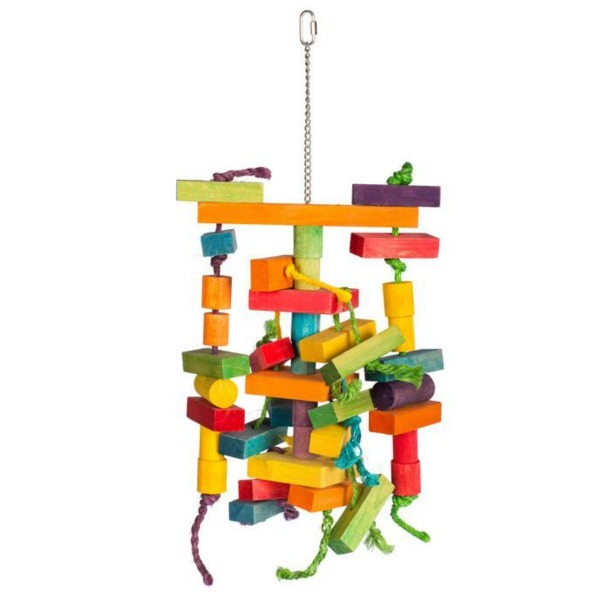 Hide and seek the toy is also fun for human and bird. 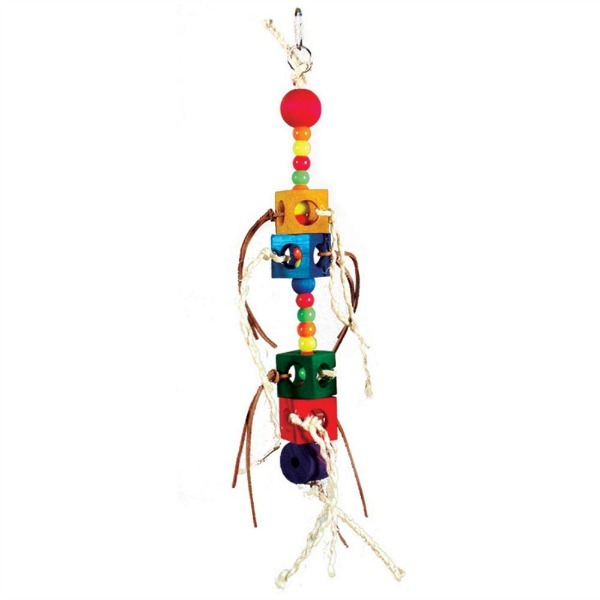 Activities that require this type of human-bird interaction form strong bonds of trust and loyalty. 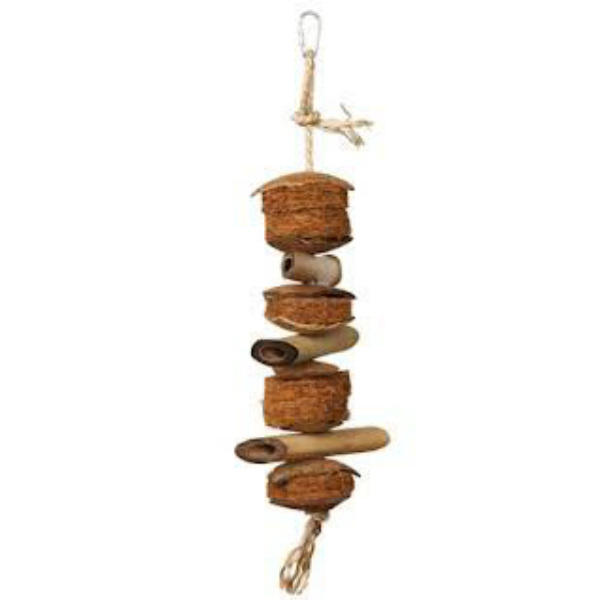 Offer a selection of toys containing wood in the right size for your bird. 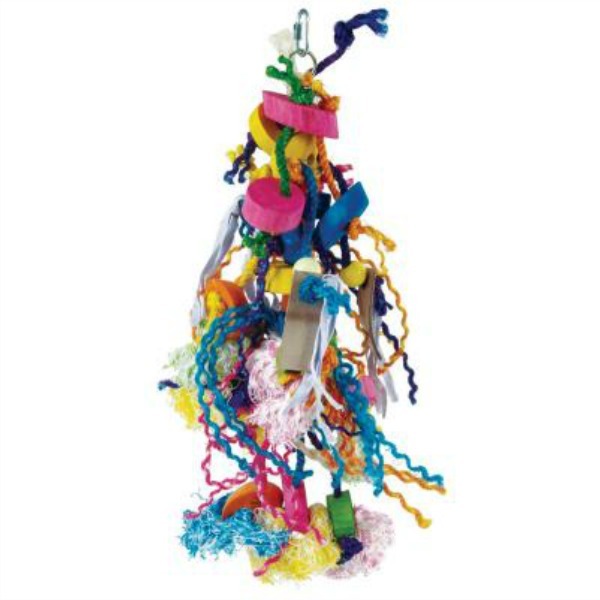 There are handy reference charts available so you can determine the correct toy size if you are in any doubt. 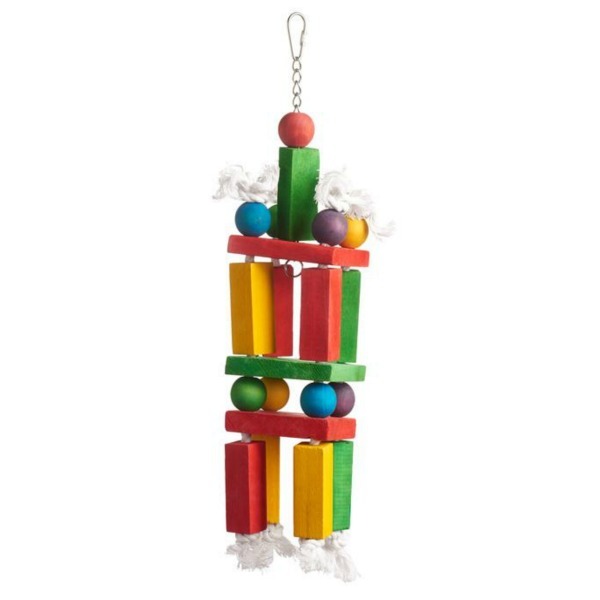 Donâ€™t choose a toy from somewhere that just tells you that it is great for macaws. 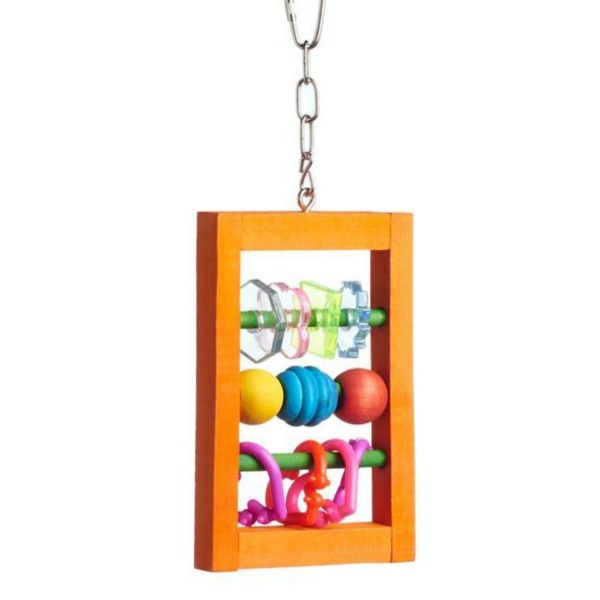 Thereâ€™s a vast difference in macaw sizes and various subspecies of other species such as conures, parakeets, cockatoos and more. 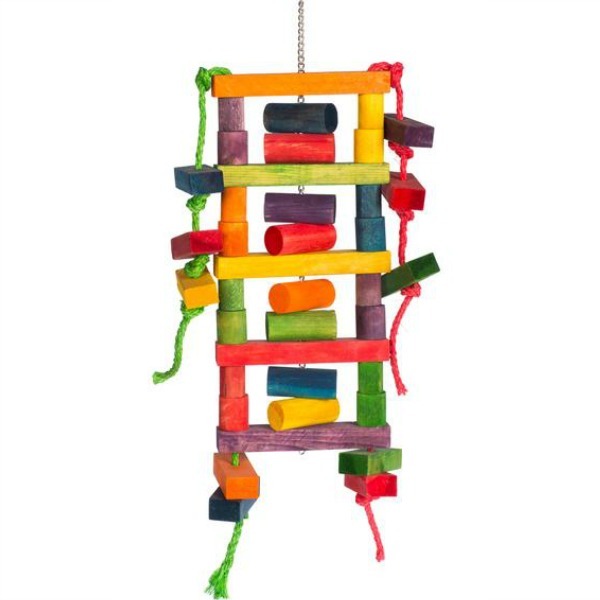 Windy City provides you with the reference tools to ensure you order the right toys for your bird and if you are still in doubt, thereâ€™s our friendly Customer Service team to help you.